Costner looks like this throughout the film. No smiles. 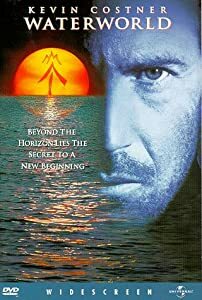 Way over budget, a fired director, Mother Nature chipping in with ravaging storms, “Waterworld” is one of those films where everything went wrong to compound a dreadful script that should probably have never been written let alone greenlit. Like many films with a troubled production history, there are flashes of a good film in there somewhere. A futuristic tale where Kevin Costner‘s lone sailor and man-mutant – he has webbed feet, gills and can survive under water – The Mariner coasts around a completely flooded Earth in a gadget-equipped catamaran. When he reluctantly gets involved with a woman whose daughter has a map to dry land tattooed on her back, his life-on-the-ocean-waves solitude is sunk by cackling, nasty baddies intent on skinning the girl. Ah, the baddies. Called Smokers and led by a hilariously OTT Dennis Hopper, there are times during his performance where you think Waterworld is a really bad comedy. Hopper plays The Deacon, leader of hundreds of brigands who reside on the rusting hull of the oil tanker Exxon Valdez. They zip about on jet skis, old planes, speedboats and anything else they can power with the remains of the oil, and generally behave like extras in a Monty Python film. 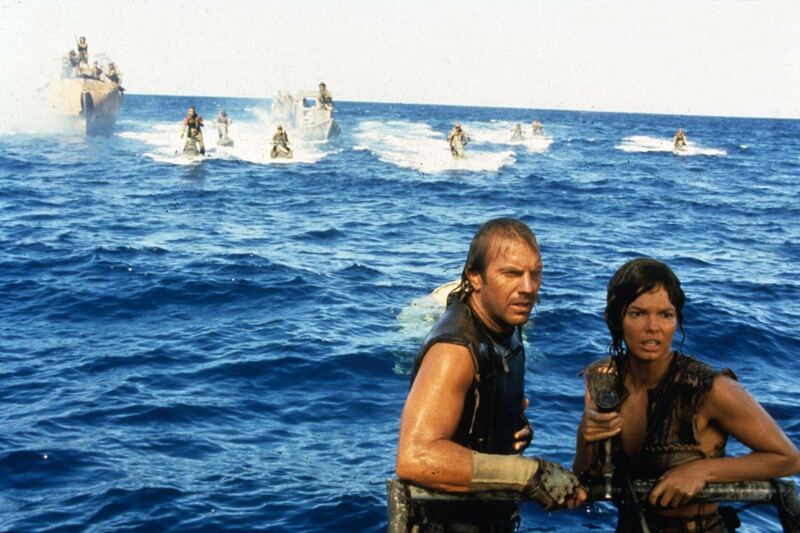 As Costner’s Mariner tries his best to protect little tattooed Enola from the big bad Deacon, we get to see the good side of Waterworld – some stylishly directed scenes of sailing ships racing at speed, sails bulging, wake crisping. Like sailing itself, you find yourself caught up in this empty, blue world where there is just wind and sea and nothing to distract you. Sadly, you get interrupted by Hopper and co. zooming in on jet skis, snarling and giggling as they hunt the girl down, snapping you out of any peaceful reverie you might have found yourself in and plunging you back into the midden of the script. That’s pretty much all there is in terms of actual plot. So what, exactly, fills the two hours+ run time (and let’s not even visit the nearly three-hour director’s cut)? Holes, that’s what. Enormous, gaping plot holes. It’s never explained why Costner’s mutant Mariner chooses to sail everywhere on a boat when he can, easily, survive under the sea. What else? It’s ignored that the Smokers (who do smoke a lot) seem to happily laugh about stray ash and butts falling into the ship’s oil reservoir, yet when the Mariner makes the same threat, they panic like nervous girls. Or why The Deacon requires a mic and loudspeaker to speak to his deck-bound crew from high up on the bridge of the ship, yet the Mariner way below can easily have a two-way conversation with him without a voice being raised. Director Kevin Reynolds, who got booted off the set (the same sets destroyed by an impromptu hurricane), handles the action and sailing sequences really well, and these give the film its best moments. It’s just a shame he never managed to rein in Hopper (well, many have tried, let’s be honest), stop the film from going USD 75m over budget, or deep-six the turgid script his old pal Costner gave him. Kevin Costner Oil Spill Machine Cleanup Technology Saves the Enviornment?